The call for entrepreneurship was once again the charge given by Minister of Social Cohesion, Dr. George Norton as he delivered the feature address at the Vryman’s Erven Training Centre’s 14th graduation ceremony. 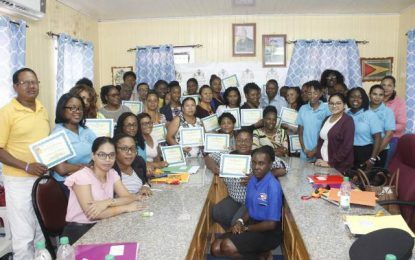 The event which was held at the New Amsterdam Town Hall in Region Six, saw 74 persons graduating from the Youth Entrepreneurial Skills Training (YEST) Programme, in several areas. These included data operations, food preparation and cookery, general cosmetology and home repairs. [from left to right] Chairperson Shurla Scott, Minister of Social Cohesion, with responsibility for Culture, Youth and Sport, Dr. George Norton, Assistant Director of Youth, Leslyn Boyce, and Instructure and Supervisor (ag) along with the graduates from the Home Repairs course. Minister Norton, who also has with responsibility for Culture, Youth and Sport, told the graduates that they are now sufficiently equipped with the necessary tools to face the demands of a changing world. The minister remarked that even though he expects to see them aggressively advertising themselves on the job market, he would strongly encourage them to become entrepreneurs. “Little phrases are caught on easily and we have a tendency that when the boys use something, the girls catch it on. So, if it is not ‘budday’, then we start using ‘boss man’. I think it is time that you start looking at yourself as the boss man or the boss woman. That is what you have to start doing and this is a start,” the minister stated. The graduates were reminded by the minister that the country has no future if it cannot depend on its young people. “Your youth is your strength …it is during these years that you must take up your rightful places as individuals who will lead this country forward. You are important and it is we as the adults and the leaders of this country who have to recognise this,” Minister Norton stated. The call to become entrepreneurs was heeded by the graduates. Speaking to the Department of Public Information (DPI) many said they were elated to have acquired skills that prepare them for the challenges ahead. Entrepreneurship continues to be one of the focus points for the government over the last three years. This has seen the government providing a number of training opportunities and other means of where youths can be in a position to start their own business. 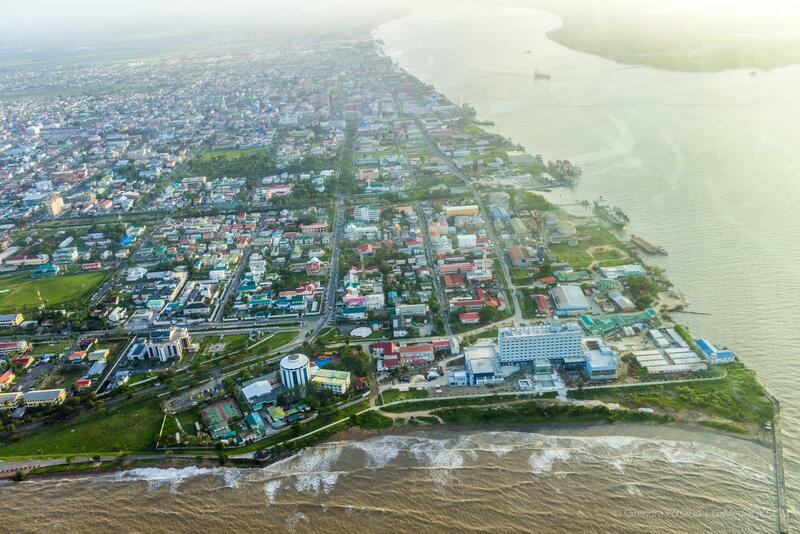 Hinterland Employment and Youth Service (HEYS), Youth Entrepreneurial Skills Training (YEST), Youth Innovation Project of Guyana (YIPoG) are just a few of the opportunities available for youths. Assistant Director of Youth, Leslyn Boyce handing one of the graduates her certificate. Minister of Social Cohesion, with responsibility for Culture, Youth and Sport, Dr. George Norton presenting Valedictorian, Rehana Primus with her trophy.